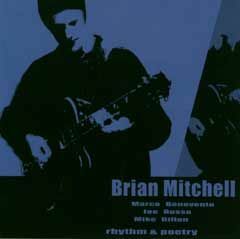 Brian Mitchell is a guitarist you've probably heard, perhaps without even knowing. His precise playing was part of Kansas' own funk outfit The Yards, as well as Carlos Washington's Giant People and Amayo's Fu Arkestra featuring members of Antibalas. His debut CD, Rhythm and Poetry, finds the highly skilled guitarist joined by Marco Benevento (organ) and Joe Russo (drums), aka "The Duo", plus Critters Buggin/Garage A Trois instrumentalist Mike Dillon (percussion, vibes, conga, tabla). This appealing combination of musicians sounds exactly as good as you think it should, and is equally as impossible to describe! Brian Mitchell was born January 1st, 1978 and raised in Kansas. After playing guitar for only three months, he was asked to play in the high school jazz band. When he received the soloist award at the Berkelee High School Jazz Band Competition in Boston, he was encouraged to pursue music professionally. After studying jazz in his home town, he moved to Lawrence, Kansas to woodshed and form a band. He was asked to tour with the band Giant People which included current and former members of Karl Denson's Tiny Universe. Soon after touring, he started to play with the Lawrence-based funk band, The Yards. After a few opening spots for John Scofield, Brian decided to move to New York City originally to play with Jo Jo Kuo (formerly with Fela Kuti), and also pursue his own projects. While occasionaly playing with members of Antibalas in Amayo's Fu Arkestra, he recently recorded his first solo album, featuring Mike Dillon, Marco Benevento and Joe Russo. At the moment, Brian is working with his long-time friend and collaborator Brad Maestas. They are writing new material and putting the final touches on Brian's new live release. The recording is being mastered by Brad at Seventh Sense Music in Brooklyn, NY. Look for him playing electric bass with the Brian Mitchell Trio in and around NYC.